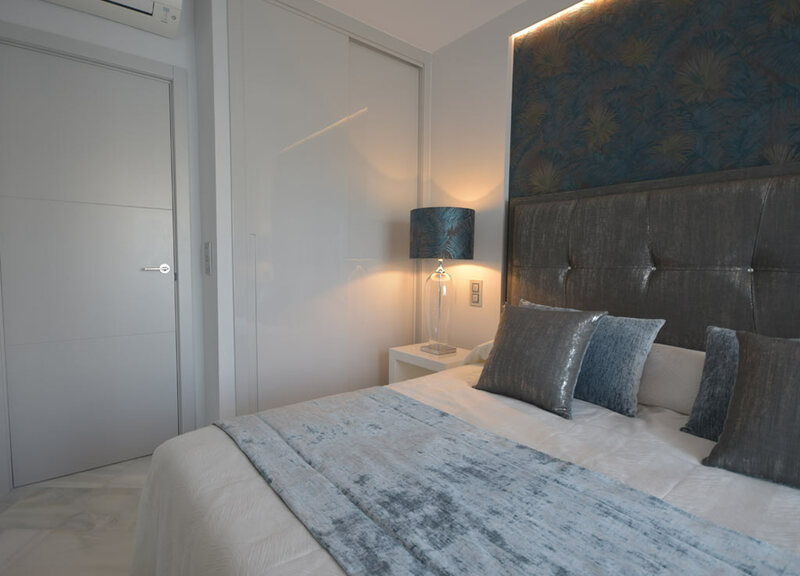 Remodelling and Interior Design for Aparthotel Vimes. 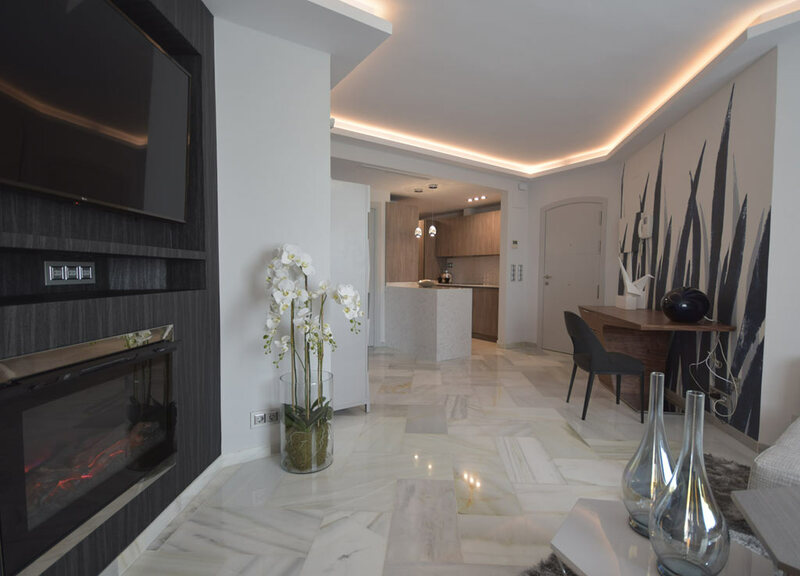 Comprehensive remodelling of an apartment located in the Elviria del Sol urbanization in Marbella. The client wanted a cosy space with an emphasis on comfort and lighting. In terms of design, what really stands out is a large mural in the living room simulating vegetation that provides a fresh look to the living space with it’s white and blue tones. The colour used in the fabrics and curtains have the same tones and combine perfectly with the painting. 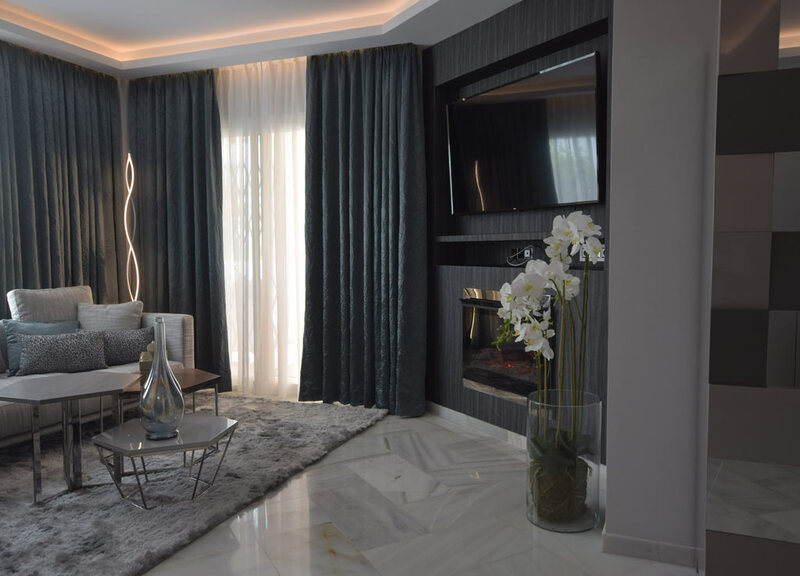 As for the furniture, the living room has been equipped with a straight sofa, in natural grey fabric, and coffee table set in different heights and materials. The fireplace is the focal point of this space, it has been covered with black wallpaper to further emphasise it’s importance. The living room’s perimeter lighting is fascinating, as it provides an indirect light that gives a sense of comfort, it’s intensity can be easily adjusted thanks to the dimmer. The wood finished kitchen is designed to make the most of the space, and is fully equipped with hidden appliances. In addition, every empty space is used as storage and makes the most of all the free space. The peninsula is lined with a mitered corner, the plugs are completely embedded in the worktop so they are only visible when necessary, therefore keeping the design clean. 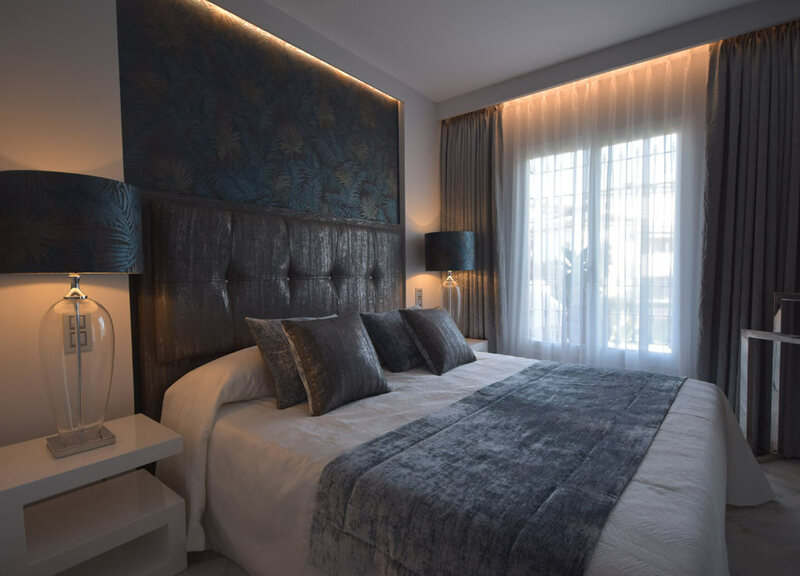 The master bedroom features the same indirect lighting effect as the living room in the headboard and curtains. In addition, the headboard is framed with the same wallpaper as the lamps. 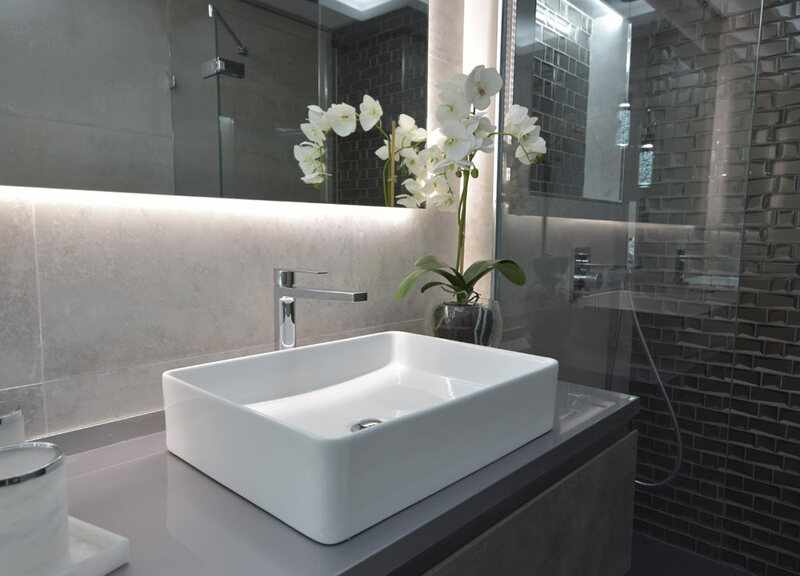 Finally, the main bathroom, which has no windows, is filled with light thanks to the indirect lighting, the backlit mirror and the ceiling lamp. 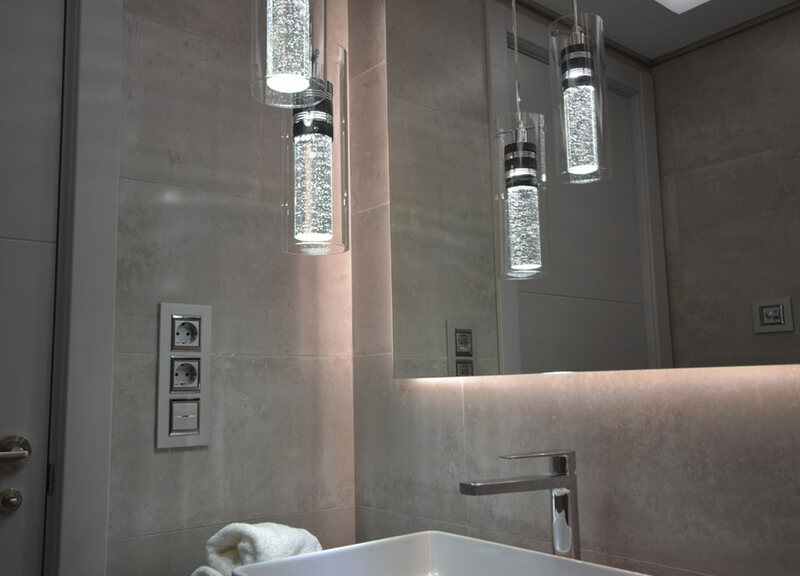 We also have a glass mosaic in the shower, niche lighting and a large cabinet to store bathroom items. The mosaic mirror in the secondary bathroom with it’s corner cabinet provides ample space and access to the shower. The covered and glass enclosed porch provides a comfortable outdoor living experience so our clients can enjoy being outdoors regardless of the weather. 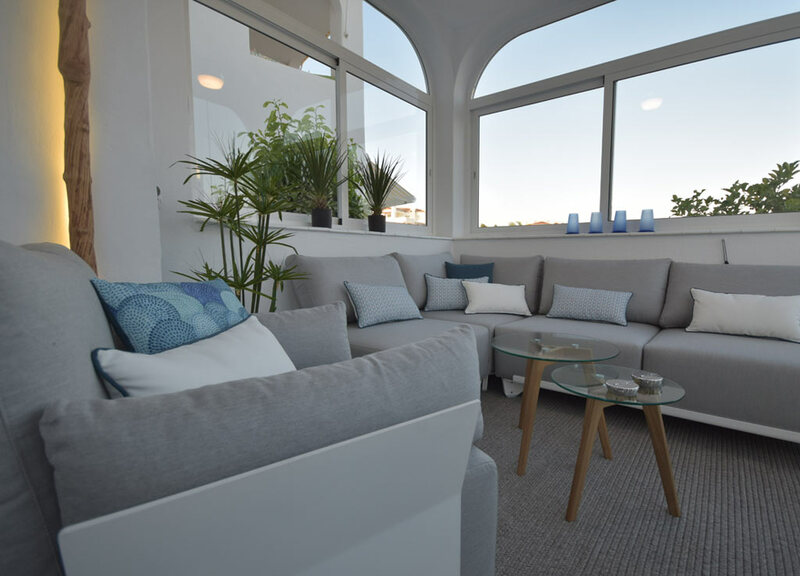 This large exterior living space featuring a sofa area and a ceiling fan is the highlight of this apartment.